readers, we have pre-prepared this special holiday edition. After our holiday Jamal will return to Bali and I will travel to Singapore and then on to Melbourne, Australia, via Darwin and Brisbane, returning to Bali on Feb. 26. The March edition of the KHO News, will feature a full coverage of our epic journey. Rainy season usually starts by the end of November, this year it started in the first week of November. Record falls have been recorded across the country causing major and minor flooding and a landslide in Java that claimed over 170 lives. The government has blamed Illegal de-forestation. KHO Cats Ember and YuYum, huddle inside the house during a severe thunder storm. Bali: Wednesday January 11 Pak Made from Warung Sobat rushed his father to Sanglah hospital in Denpasar, the father has suffered asthma for some time and was having an attack. Sadly early on the morning of Thursday January 12 he passed away. During the morning dozens of family and friends arrived at Sobat and prepared for the burial which took place later that afternoon. Pak Made's father was buried in the little cemetery 100 meters down from Warung Sobat. At some later date when there is a huge cremation ceremony the body will be exhumed and cremated. Pak Made's father was estimated to be about 67 years old. In the days when he was born it was not common to keep records. A busy week before our departure for Malaysia/Thailand, a wonderful excuse to party. While we are away we will travel from Surat Thani to Penang Island by train. You can travel from Singapore to Bangkok with a Malaysian Train to Penang, then Thai Railways to Bangkok. Also there are trains in the reverse direction. From Singapore to Bangkok will cost you around A$50 for a second class sleeper. You can break your journey, by just booking point to point. A typical itinerary would be first to travel Singapore to Kuala Lumpur, spend a few days there, then travel on to Penang, you could even overnight at the classic Majestic hotel in Ipoh on the way. After a few days in Penang travel up to Surat Thani, from where you can visit Phuket and Ko Samui. From Surat Thani travel to Kanchanaburi stay a few days on a floating hotel and explore the Bridge over the river Kwai, then on to Bangkok. bridge. Built in Japan in 1972 and operated as the Silver Star train in New Zealand, it's carriages were then remodelled by Gérard Gallet, the man behind the refurbishment of Venice Simplon Orient-Express. and Thailand. This time Dede came by train. Since the Indonesian 127% fuel price hike, the train is now cheaper than the bus. 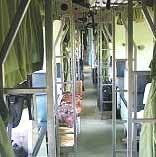 Train Rp210,000 (A$30) Bus Rp 275,000 (A$40) Journey distance 900 km. Dede travelled overnight on the Mutiara Selatan (Pearl of the South) to Surabaya then connected to the Mutiara Timur (Pearl of the East) to Banyuwangi, then bus to Bali. served at 8am in the warmer on the buffet next to the dining table. Anyone can help themselves when they want - very practical, especially when we have guests. The KHO beer fridge in the garage was looking a little worse for wear, the front had started to rust, as does everything in the tropics including the ex-pats. Sudah Karet - already rusty is a term used by the locals to refer to expats who have lived here a long time and have become sun tanned. Meanwhile - we sanded back all the rust, treated the rust with rust converter, then painted it with ship quality anti-rust KHO Green paint. Hopefully we will get a few more cold beers out of the old girl yet. Indonesian Immigration Dept to be cleaned up. Jamal's hometown of Bandung is the provincial capital of West Java, Indonesia. Located on a highland plateau 768 meters above sea level,, the city has a population of around 2.1 million. Bandung became famous as the venue for the 1955 first conference of Non-aligned nations. The 50th anniversary was celebrated last year. In 1488, the area now named Bandung was the capital of the Kingdom of Pajajaran. During colonial times, the government of the Dutch East Indies built a supply road connecting Batavia (now Jakarta), Bogor, Cianjur, Bandung, Sumedang and Cirebon. The Dutch built wide tree-lined boulevards, villas, gardens, and fountains, earning Bandung the nickname of the Paris of Java. Many of these structures survive to today, and can be seen along the road leading to the Dago area north of the city. In the 1930s the Dutch East Indies government planned for Bandung to become the capital of the Dutch East Indies, W.W. II disrupted these plans. The Savoy Homann Hotel in Bandung was first built in 1880 as a grand colonial hotel of it's day. 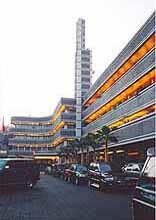 In 1938 the Savoy Homann Bidakara Hotel got its new classic Art Deco design. It has been completely restored over the last few years to create an elegant ambience of modern comfort and the nostalgia of years gone by. Government owned Bio Farma is the only vaccine and serum manufacturer in Indonesia and is being considered by the U.S. drug manufacturer Baxter Healthcare to produce a human vaccine for bird flu. Indonesian Health Minister Siti Fadilah Supari - said she hoped a deal could be signed before January, said "We will co-operate as long as Baxter agrees to make a vaccine for the Indonesian strain" The strain has killed 9 people in Indonesia. Scientists fear the virus could mutate into a form that could start a pandemic. 1923, occupying an area of 93,200 square meters. Animal breeding for laboratory purposes was established at Cisarua-Lembang on an area of 282,411 square meters. Following the nationalization of all former Dutch colonial companies, series of changes have occurred within the company. In 1978, by virtue of the Government Regulation No 26, the company obtained the status as a public utility company. 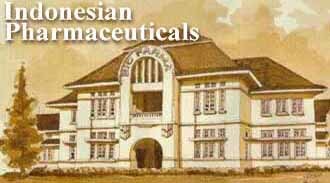 By virtue of the Government Regulation No 1 in 1997, it became a limited company, known as PT Bio Farma (Persero), located in Bandung, West Java. The Laboratory of Virology was established in 1995, it has played important role in viral disease survey in Indonesia, especially Polio, Dengue and Hepatitis B. WHO assigned Bio Farma Laboratory of Virology at the Laboratory for Polio Eradication, and has performed well during the recent mass immunization of Indonesian children. Bio Farma now has WHO Qualified status achieved through Bio Farma's consistency in strict international standard quality control and quality assurance allowing Bio Farma to export and earn hard currency for Indonesia. First export was to North Korea, 221,200 vials in 1997. Then they exported 2.5 million doses of polio vaccine to India in 2000. Now exports extent to many countries including Malaysia, Philippines, Sri Lanka, Bangladesh, India and the Ivory Coast. Yudhoyono will order that fuels such as gasoline are mixed with 5 percent of bio-diesel or bio-ethanol from early next year, Kadiman said. 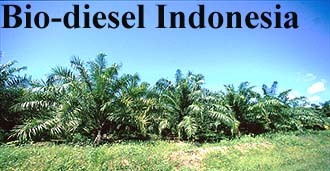 The government will promote the use of bio-diesel, a mixture of diesel and palm oil, to reduce reliance on oil-based fuel as well as to reduce carbon emission, he said. idea of an engine that relied on a high compression of the fuel to ignite it, eliminating the spark plug used in the internal combustion engine. He received a patent for the device on Feb 23, 1892 and a major milestone was achieved when he was able to run a single piston engine for one minute on Feb 17, 1894. This machine stood 10 feet tall. Diesel was born (Mar 18, 1858) in Paris of German parents, and died (Sept 30, 1913) on the English Channel in suspicious circumstances, possibly suicide. Rudolf was a good student in primary school and was admitted at age 12 to the Ecole Primaire Superieure, the best in Paris. On the outbreak of the Franco- Prussian War, he and his parents were considered enemy aliens, and were deported to London. Later he returned to his father's home town, Augsburg, where he entered the Royal County Trade School, he won a scholarship to the Technische Hochschule of Munich, where he was an outstanding student. 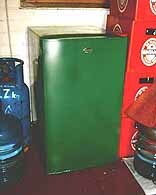 he returned to Paris and became a protege of Carl von Linde, the pioneer of refrigeration. He set up his first shop-laboratory in 1885 in Paris, and began full-time work on his engine. This continued when he moved to Berlin, working again for Linde Enterprises. 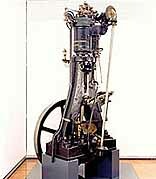 In 1892 he was granted a German patent for the engine, and found some support for its continued development. Jusuf Kalla was born Watampone, South Sulawesi; May 15, 1942.
business empire. It all started from a family business established in 1952 that was almost on its last legs. The business of Hadji Kalla was very badly hit by the economic crisis of 1966. The business, traded in agricultural products and had debts everywhere. "Shall we just close the business down?" asked his father, the head of the business. Jusuf Kalla, shook his head. Instead, he chose to take over control of his father's business through the transportation company NV Hadji Kalla. In the hands of Jusuf Kalla, the company not only began to recover but even succeeded in expanding. In 1969, NV Hadji Kalla was entrusted by PT Toyota Astra Motor to be the sole agent for Toyota in eastern Indonesia. Time was seemingly on the side of Kalla. The business group grew like an octopus until it became one of the most respected business groups in eastern Indonesia. Not satisfied with just being a "local" businessman, Jusuf started building a new business empire outside of Sulawesi. Together with several colleagues, such as Fadel Muhammad, Kalla built up Bukaka. With Bukaka, Kalla expanded into many sectors, extending from trading into construction, property, transportation, agro-industry and even telecommunications. What helped make the name of Bukaka well known was its manufacturing of airbridges, to connect airports with airplanes. In October 2004, Jusuf Kalla was elected as Vice President and Susilo Bambang Yudhoyono as President. He gave up all his positions as number one in the Kalla Group. His younger sister and brother Fatimah and Achmad, took over control of the Kalla Group and Bukaka. President & Vice President Kalla brief journalists about the situation in Ache after the 2005 tsunami. Jusuf Kalla reportedly owns a Fokker F-27 Fellowship jet airplane. The aircraft is often seen at Halim airport in Jakarta when Jusuf is in town. An airport worker revealed the aircraft is fitted with 4 luxury convertible bed seats as well as 30 first class seats. "Kalla likes to sleep on flights so he arrive refreshed" said the airport worker. We were unable to find the history of the aircraft but it probably was previously owned by an Indonesian domestic airline. The person who has no interest in aviation would probably say: "See one aeroplane seen 'em all". However, there are some airliners which stand out from the crowd that even non-enthusiasts would recognize. In the 50's there was the Lockheed Super Constellation, whose art deco lines set her apart from the other piston powered airliners. In the sixties it was the Jet Age - Boeing 707, the first jet airliner produced in the USA. The only previous jet air liner was the unsuccessful British deHavilland DH-106 Comet. The 707 was radical in design and set the shape of all future passenger aircraft to come. The most noticeable innovation was mounting the four jet engines under the wings, this was a far safer position in the case of a catastrophic engine failure, excellent for maintenance and down loaded the wings reducing stress on the wing roots. 707-138 jet aircraft. Boeing 707 services to the US began in July. 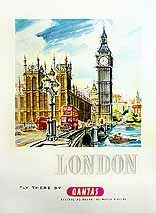 In September the service was extended to London via New York. The Sydney - London kangaroo services via India began in October. 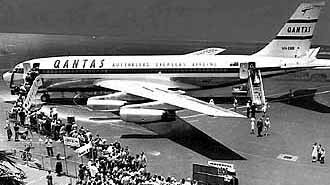 The original Qantas 707's were fitted with Pratt & Whitney JT3C-6 turbojet engines originally designed for the B-52 bomber. They were noisy, dirty and not fuel efficient. increased thrust and saved fuel. Qantas being the world's longest haul airline immediately ordered the upgrade, the first aircraft VH-EBA leaving for Seattle in June 1961. Qantas decided they would re-paint the modified aircraft in the new V-Jet livery designed to highlight the extended range Boeing 707 aircraft. The "V" stands for the Latin word "vannus" which translates literally as "winnowing basket" or more loosely, "a device for blowing the grain" or "a fan". Hence V-Jet denotes Fan Jet. 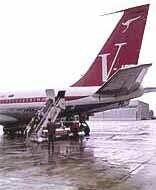 The first V-Jet entered service Sept. 1961, progressively the entire 707 fleet was modified, the aircraft was then know as the B-707-138B. Qantas became known as Qantas - "The Around the World Airline" They flew Sydney, Nandi, Honolulu, San Francisco, New York, London, Rome, Baghdad, Karachi, Calcutta, Singapore, Jakarta, Sydney and also in the reverse direction. Later Qantas Boeing 707 V-Jet services to Hong Kong, Tokyo, Bali, Port Moresby and Johannesburg were added. Qantas did have one fatal accident in the 1940's when they were operating flying boats. 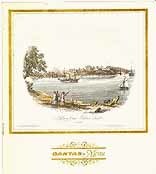 Although Qantas prefer to claim they were operating under the name of Qantas Empire Airways in those days. The accident happened 11/10/1944. The Aircraft was on an scheduled service from Sydney to Townsville, the aircraft returned to Sydney 45 minutes after departure reporting an engine defect. The aircraft was landed heavily at Rose Bay, broke in two and sank within 15 minutes. One passenger was drowned, Mr J.R. Mott. The pilots, K.G. Caldwell and L.J. Brain, the five other crew members and the remaining 21 passengers were rescued. The subsequent investigation concluded that the accident was due solely to faulty handling of the aircraft by the pilot. April 1969: John and friend Ian Davey departed Sydney for San Francisco via Nandi & Honolulu. In those days in Sydney Qantas only had a small terminal, actually only a waiting lounge and check-in in the old Ansett terminal, the aircraft was towed out from the Qantas hanger and parked behind the Ansett terminal for boarding. The QANTAS 707 had only 120 seats compared to other airlines in the States who operated the aircraft in 147 mixed class or up to 215 in full economy. Qantas specified the reduced seat numbers to extend the range of the aircraft. you to your seat and make sure your hand luggage was secure. 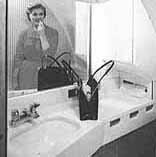 Most was stowed under the seat as the 707 only had a hat rack, over head Cabin stowage did not exist. We departed around 5 pm for the 3233 km flight to Nandi, Fiji. The flight took over 4 hours. During the flight we were served an excellent meal with French wine. We were most amused that if we rang the bell for service, the steward would address you by name - "Yes Mr Symons, how can I help you?" I was intrigued by how the Steward knew you name. Later in the galley, I noted a board with a seating plan on the wall. On boarding you presented your hand written boarding pass, they removed a tear off slip with your name on it and put it into your seat position on the wall seating plan. We arrived in Fiji around 10 pm local time. After a couple of hours and a few drinks, the aircraft was refuelled and we were ready to take off on the longest leg of the journey 5,100 km direct to Hawaii. and it was suddenly yesterday, then I crossed Equator for the first time in my life. map, the accuracy was critical, because Hawaii is quite small, if off course you could fly right past, run out of fuel and be forced to ditch. The Boeing 707 was fitted with special upward looking windows in the cockpit for this purpose. In the middle of the night during the flight to Hawaii, Ian and I asked if we could visit the cockpit, Steward Mr John Betts obliged. On entering the cockpit I was surprised to see the navigator standing on the Captains seat trying to angle his sextant, to get a reading through the upfacing window, The sextant windows were obviously an after thought. Early in the morning we arrived in Honolulu Airport Hawaii. QANTAS was instrumental in pioneering flights to Hawaii and helped make tourism it's major industry. 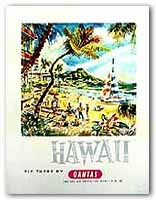 The inaugural flight to Honolulu was on on June 30, 1959. We stopped for 2 days in Hawaii, staying at Waikiki Beach. We splurged and dined at the famed Royal Hawaiian Hotel. 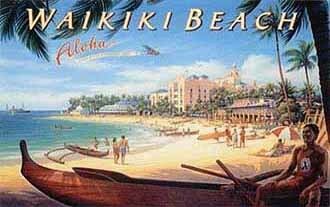 Waikiki Beach in those days was just like a small town, in the street we ran into our Qantas Crew who were also stopping over for 2 days in Honolulu before flying on on the same flight as us to San Francisco. 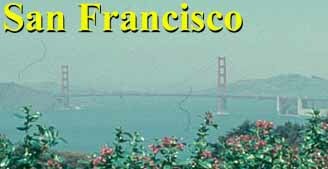 We had a daytime flight to San-Francisco, the Boeing 707 performed effortlessly over the 3,870 km and which took us almost 5 hours, during the flight we were served an excellent lunch and complimented with French wine. those days things were far more liberal than in the times we live now. The steward said they would only go in the rubbish otherwise. At last we were on final approach into San Francisco International. We had covered a total of 12,200 km in a total flying time of about 15 hours. This flight 37 years ago still outshines the hundreds of flights I have had since. The Qantas 707-138 V-jets flew until 1966 when they were progressively replaced by the Boeing 707-338 series. By 1972 Qantas were operating 19, 707 aircraft, September 1971 Qantas took delivery of their first Boeing 747 Jumbo Jet, as more 747's arrived the 707 was phased out. Many were relegated to less dense routes or converted to freighters. Some 707s were sold" to the airlines of emerging nations and some became glamour VIP transports for heads of state & high profile entertainers. purchased the aircraft from the late Frank Sinatra's estate.